This post continues the series, “Behind the Scenes at Houghton,” giving a glimpse into the inner workings of the library’s mission to support teaching and research. Thanks to Magdaline Lawhorn, Association of College and Research Libraries (ACRL) Resident & Project Archivist, for contributing this post. 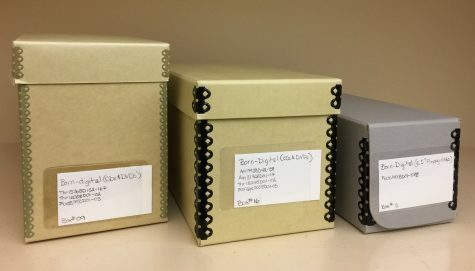 In Born-Digital Blog Post #6 we began to discuss the five basic elements we capture during our born-digital accessioning process: identification; media type; storage size; visual representation of the physical media; and removal/segregation of materials. This blog post will continue the discussion, focusing on the last two elements: visual representation and removal/segregation of materials. To capture the visual representation of the materials we photograph the media. We mainly use the Solo8 HoverCam to take photographs from above. Within the born-digital community taking photographs is often debated; some consider it a useless step because the physical item is not as important as the content. Photographing is certainly an optional step, and its importance needs to be determined by the individual repository. For Houghton these images allow us to document any information written on the physical media (by the creator), adding another layer of authenticity. What appears on the media is informative and might prove useful when it comes to describing the materials in a future resource record such as a finding aid, the document that broadly describes what is in a collection. Example of photographs taken by the Solo8 HoverCam showing descriptions on the CD and the spine of the case. The final step in our born-digital accessioning process is to remove the media from the parent (original) collection. During the removal process, in Alma (web-based library cataloging platform) we create a “544 note” in the bibliographic record to show that we separated out the born-digital media. Mirroring this note in the resource record, we create a “Separated Materials” note in ArchivesSpace, our web-based archival collection description and management platform. We make these notes to establish the physical whereabouts of the items and to track their stage in the accessioning process. 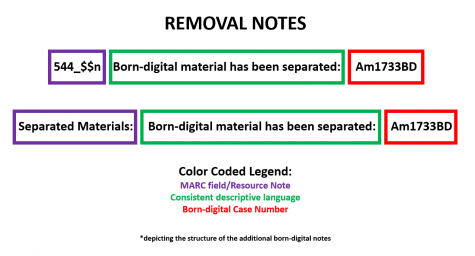 Example of the born-digital removal notes added to ArchivesSpace and Alma, showing that we located materials in collection MS Am 1733 and separated out the born-digital materials. The physical born-digital materials are segregated into boxes with like materials: CDs with CDs and 3.5” floppy disks with 3.5” floppy disks. Thus, one box can hold more than one collection. The boxes are numbered consecutively; the outside label carries the number of the box, the type of media, and the evidence number range (e.g., Am1793BD42 – Am1793BD59), which relates to the collection. All of this information is also recorded in the Born-Digital Media Log (discussed in Blog Post #6). Storage boxes for CDs/DVDs and for 3.5” floppy disks in various sizes. Sequestered in storage boxes, these materials await another stage in the workflow which blurs the line between what archivists think of as “accessioning” and “processing.” This next stage can be thought of as the sixth accessioning element or the first part of the processing stage, when disk images are created. Right now we do not include disk imaging in our accessioning workflow, but we are seriously considering incorporating it at the accessioning level. Doing so would align with our current staffing model, since born-digital material is being handle solely by the accessioning team. Disk imaging at ingest would allow us to make a preservation copy sooner, rather than postponing it until the processing level at a later date (which can vary drastically depending on the current backlog and priorities). In the following blog post we will discuss Houghton’s next steps after accessioning. Stay tuned for more born-digital discoveries and developments!